Mohammadi Kamrava, H., Barati, M. (2011). Magnetic Properties and Phase Transitions in a Spin-1 Random Transverse Ising Model on Simple Cubic Lattice. International Journal of Nanoscience and Nanotechnology, 7(4), 161-166. H. Mohammadi Kamrava; M. Barati. "Magnetic Properties and Phase Transitions in a Spin-1 Random Transverse Ising Model on Simple Cubic Lattice". 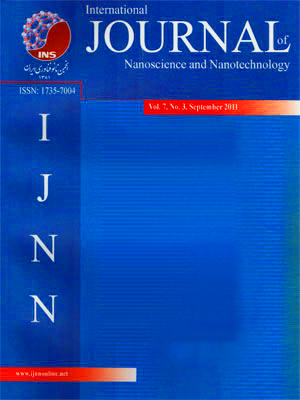 International Journal of Nanoscience and Nanotechnology, 7, 4, 2011, 161-166. Mohammadi Kamrava, H., Barati, M. (2011). 'Magnetic Properties and Phase Transitions in a Spin-1 Random Transverse Ising Model on Simple Cubic Lattice', International Journal of Nanoscience and Nanotechnology, 7(4), pp. 161-166. Mohammadi Kamrava, H., Barati, M. Magnetic Properties and Phase Transitions in a Spin-1 Random Transverse Ising Model on Simple Cubic Lattice. International Journal of Nanoscience and Nanotechnology, 2011; 7(4): 161-166. Within the effective-field theory with correlations (EFT), a transverse random field spin-1 Ising model on the simple cubic (z=6) lattice is studied. The phase diagrams, the behavior of critical points, transverse magnetization, internal energy, magnetic specific heat are obtained numerically and discussed for different values of p the concentration of the random transverse field.